All of Simply7's Quinoa Chip flavours are designed to deliver all the flavour and nutrients of the ancient super grain quinoa. These Sour Cream & Onion chips are light and creamy with a dash of tangy spices for a cool, crisp treat. Each bag is packed with smooth sour cream, and garden-fresh onion flavours for a healthier snack with a taste you’ll love. With a light, zesty crunch, Simply7 Sour Cream & Onion chips are the perfect snack to satisfy any craving. Ingredients: Quinoa Flour, Potato Starch, Corn Starch, Expeller Pressed Safflower Oil, Corn Flour, Rice Flour, Salt, Sugar, Organic Whey, Onion Powder, Organic Cream, Lactic Acid, Dehydrated Parsley, Natural Flavors, Yeast Extract, Citric Acid, Organic Buttermilk Powder. Love the crunch. Can't wait to try out some of the other flavours. 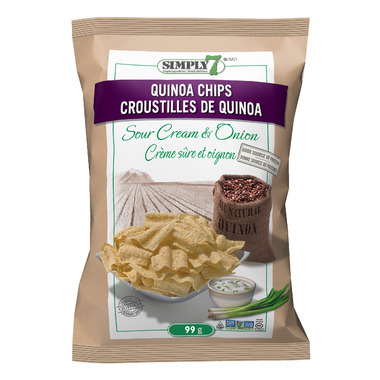 Excellent healthy alternative to greasy potato chips for satisfying your sour cream & onion fix. Yummy! I agree- compares to Sunchips but a lot healthier. Delicious! These are the best "healthy" chip I've ever eaten! Very similar to sun chips but so much better for you. I highly recommend these for those who love to snack but are trying to eat less preservatives. Great snack! 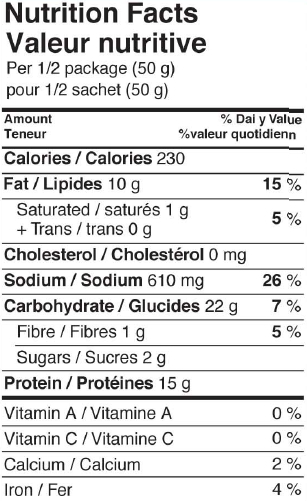 Love the protein content! These are great! They remind me of sun chips but healthier. I only with the sour cream & onion flavor was more pronounced. These are AMAZING! As a chip fiend I was worried that something healthy wouldn't taste as good - IT TASTES BETTER! I get them every time I buy. These are delicious. I have to stop myself from eating the entire bag in one sitting. Very tasty! My first time trying quinoa chips and these were really good. Price is a little high for the amount. These are absolutely fantastic! So completely delicious. I had to take a star off though because they are also ridiculously expensive for the size of bag you get - each bag has only two servings. These were a really good, healthier alternative to chips. I enjoyed them and will be buying again.